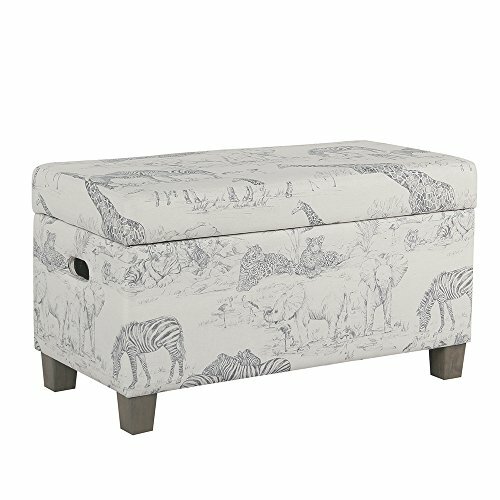 Our kids’ jungle storage bench can corral your kids’ toys, add whimsy to a bedroom or brighten up a playroom. The gray toned safari print has a hand drawn look that spans style and gender. With wood legs in a gray washed finish, our kids’ bedroom storage bench provides kid-sized seating and child-friendly storage. With a hinged lid top, our kids’ storage bench is easy for Small hands to open and close and can help keep the toy collection manageable. Easy to assemble and maintain. Sold wood legs in a Gray wash Finish supports up to 250 lbs.